Roofing Madison WI | Which Roofing Material is Best? Which Roofing Material is Best for Your Home in the Madison, WI, Area? A new roofing system is far from an everyday investment, so you will want to do some research before determining which kind of roof you will want to install on your home in the Madison, Wisconsin, area. With so many different kinds of roofing systems to choose from – asphalt shingles, clay and concrete tiles, slate, wood shingles and shake, to name a few – you may be wondering which roofing material is the best decision for your home. Out of all of the materials available on the market today, there is one kind of roof that consistently outperforms the others: steel. Will last long – Steel roofs are incredibly strong and last much longer than asphalt or wood. They can withstand high winds, easily shed snow, and are resistant to fire, mildew, insects, and rot. 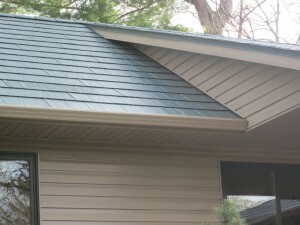 Are attractive – Steel roofing systems come in a large variety of roofing styles, patterns, and designs, and look great on all kinds of house styles, including bungalows, cabins, cottage-style, and more modern-looking homes. Provide energy efficiency – Steel roofs are excellent insulators, so not only will it keep your home’s interior warmer during the winter and cooler during the summer, it may also help lower your monthly energy bills. At ABC Seamless Home Specialists, we can provide you with a seamless steel roofing system that will dramatically enhance your home’s curb appeal, provide superior energy efficiency, and last a lifetime. In fact, we are so confident in the long-term performance of our steel roofing system that we back them with a lifetime transferable warranty. Contact ABC Seamless Home Specialists today to learn more about the benefits of the steel roofing systems we provide to homeowners in the Madison, WI, area, and beyond.